BirdLife International. Threatened Birds of Asia: BirdLife International Red Data Book. Cambridge: BirdLife International, 2001. Grimmett, Richard, et al. Birds of the Indian Subcontinent. London: Christopher Helm Ltd., 1998. Hagemeijer, Ward J.M., and Michael J. Blair, eds. The EBCC Atlas of European Breeding Birds. London: T.& A.D. Poyser, 1997. Islam, K., and R.N. Williams. "Red-Vented Bulbul (Pycnonotus cafer), Red-Whiskered Bulbul (Pycnonotusjocosus)." In The Birds of North America. 520 (2000). Jeyarajasingam, A., and A. Pearson. 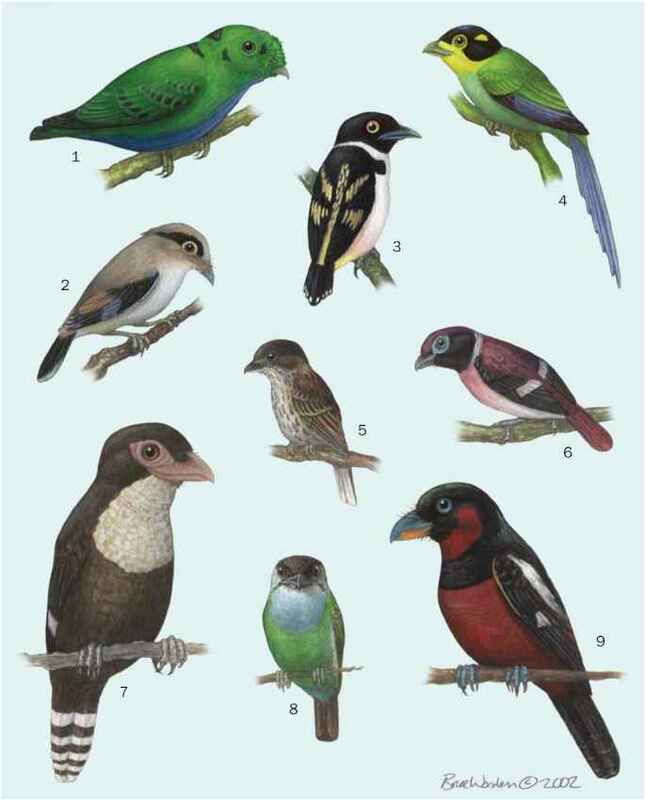 A Field Guide to the Birds of West Malaysia and Singapore. New York: Oxford University Press, 1999. Keith, S., E. Urban, and C.H. Fry, eds. The Birds of Africa. Vol. IV. San Diego: Academic Press, 2000. MacKinnon, J., and K. Phillips. A Field Guide to the Birds of China. New York: Oxford University Press, 2000. Brosset, A. "The Social Life of the African Forest Yellow-Whiskered Greenbull Andropadus latirostris." Z. Tierpsychol. 60 (1981): 239-255. Cibois, A., B. Slikas, T.S. Schulenberg, and E. Pasquet. "An Endemic Radiation of Malagasy Songbirds is Revealed by Mitochondrial Sequence Data." Evolution 55, no. 6 (2001). Dowsett, R.J., S.L. Olson, M.S. Roy, and F. Dowsett-Lemaire. "Systematic Status of the Black-Collared Bulbul Neolestes torquatus." Ibis 141 (1999): 22-28. Narang, M.L., R.S. Rana, and P. Mukesh. "Avian Species Involved in Pollination and Seed Dispersal of Some Forestry Species in Himachal Pradesh." Journal of the Bombay Natural History Society 97, no. 2 (2000): 215-222. Pasquet, E., L. Han, O. Khobkhet, and A. Cibois. "Towards a Molecular Systematics of the Genus Criniger, and a Preliminary Phylogeny of the Bulbuls (Aves, Passeriformes, Pycnonotidae)." Zoosystema 23, no. 4 (2001): 857-863. (Pycnonotidae: Andropadus) Supports a Montane Speciation Model." Proceedings of the Royal Society of London B, 264 (1997): 1337-1344.